Why Sekurit is your ultimate protection from vehicle theft! It's intelligent, anticipates your needs, is there relentlessly day and night to protect you. Sound like a good friend to have? Absolutely! It's the "Personal Recognition System" and it's the latest edge of evolution, in vehicle security. If a thief tries to "Hot Wire" your vehicle, the vehicle is shut down. Even if a duplicate key is made, the Sekurit system locks them out unless the "Personal Identifier is present and activated. If you elect to keep the control fob on your key chain, we recommend to set your fob to the manual mode. Manual mode requires you to push the label to activate the vehicle starter system. Well, It's smart. 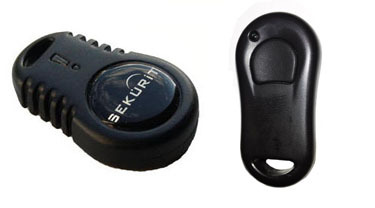 When your "Personal Identifier" is in your pocket, purse or on your key ring, When your Identifier is set to "Motion Activate", Sekurit knows when you approach and exit your vehicle. It arms and disarms with automatic, hands free operation. This is known as "passive arming" and is recommended by insurance companies and law enforcement as the beat way to protect your vehicle from theft.. The read range is about 30 to 40 feet. Using micro-electronic circuitry, the Immobilization Control Circuit TM (ICC), interface's directly into your vehicles' starter system. In many vehicles the installation is done without cutting any of the factory wiring. Sekurit is hard wired into the vehicles not compatible with the plug-in option. If your vehicle is a plug-in installation, your original relay will be placed in the glove box. We suggest you hide it somewhere else in the vehicle.